It is ironic that here in the land of complicated schedules and a season for everything, we must borrow from English to express the notion of timing. You will find the word ‘timing’ in Larousse and other French dictionaries, translated as ‘minutage’. It seems to particularly focus on an action plan or steps needed to complete a task. The expression ‘le bon timing’ is often associated with business and politics, where timing dictates a strategy of attack. By extension, it is useful to remember as a motto for life in France. I learned the importance of timing shortly after moving to France. We were invited for drinks with friends and arrived, as is our wont, right on time. Me because being prompt is ingrained along with saying ‘sorry’ and husband because, well, he is always thirsty. To my dismay I discovered that we were the first of the convives, and to add injury to insult, were then made to wait until everyone had arrived before being offered a drink. “On va attendre les autres?” asked our hosts, glancing pointedly at the array of bottles enticingly standing by. As they clearly assumed we should wait for the others to arrive, we nodded in dumb agreement then proceeded to make polite but dull conversation for the next hour. After that I became rather laissez-faire about showing up to social events on time. And sometimes had a drink first. This strategy backfired on occasions when, it turned out, the French are almost obsessively prompt. When it comes to public meetings and events, or closing times, for example, which can be absurdly early. If you don’t get there on time, it will be over before you even get started. It is traditional in France for le maire to host a new year’s reception for the town’s citizens. We showed up only a little late and missed both the mayor’s speech and our complementary glass of champagne. There is little point in arriving at a restaurant hoping for a meal before or after the designated serving times at lunch and dinner (generally just before 12:00 until 1:30 or so at lunchtime and not before 7:30 p.m. in the evening). You may not be served and if you are, will certainly not be welcome. Don’t bother trying to join a group or take up an organized activity other than at the beginning of the season in September or possibly at the start of a new year. Do not expect to find strawberries or melon on the menu in the winter or fondue in summer. Seasonal appropriateness must be respected. Don’t look for summer gear in the shops before May or after July. Back-to-school items will be on display everywhere from early August until September. After that, you will have to be content with a few dusty leftovers. As for holidays, you will want to plan your destination well in advance, book early and get a head start on traffic. Don’t forget the school calendar and the various zones (A, B and C) depending on the region. Alternatively you can always just forget about le timing altogether, sit back and let it ride. Have another glass of wine. Who’s to say? That train may never even show up. What’s your approach? Do you worry about being on time or always arrive fashionably late? You may be surprised by this list – it’s not about the food. In France, good food and wine are pretty well a given. But there are a few things about the restaurant experience itself that I appreciate. Of course, by ‘French restaurants’ I mean restaurants in France rather than those that serve French food. 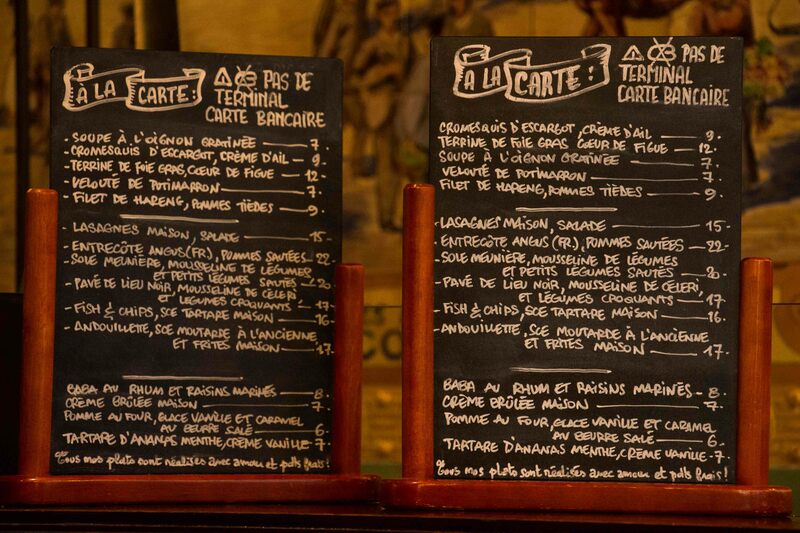 Restaurants in France have a strict hierarchy, from the simple café-bar that serves the odd jambon-beurre to the Michelin-starred restaurant gastronomique. In between are all the traditional and family-run establishments where you can get a full meal including starter, plat du jour, dessert and coffee at a very reasonable price. It won’t be fancy, but it will be what it claims to be: nothing more or less. A recently voted French law comes into effect in 2015 obliging all restaurants to clearly identify on their menus freshly prepared foods or dishes with a ‘fait maison’ logo. Flat or sparkling, large or small bottle: whether as an apéritif or an accompaniment to any meal, you will always be offered eau minérale (at a cost) along with your wine. If you insist, of course, all restaurants are obliged by law to provide a carafe d’eau (tap water) for free. But don’t be afraid to ask twice. The French take the time to enjoy a proper meal at lunch and even more so in the evening. You will never feel rushed at table, or (horror!) have your plate removed before you are finished, as has happened to me more than once outside of France. Assuming you are dining at a full-service restaurant, you will be offered, in this order: apéritif, appetizer, main course, cheese or dessert, coffee. You can try to speed it along; it’s like trying to swim against the current. My husband, who prefers the speedier North American style of service, repeatedly asks to have his coffee served with dessert; it invariably arrives after. Tipping is entirely optional in France (as it should be!). Not just in theory but in practice. Service is included with the tax so if you do leave a tip, there’s no need to make it 10% of the bill as you would in many English-speaking countries. Leaving a few coins at the end of a meal is standard recognition for good service and will be appreciated by the wait staff. When I first came to France I was frustrated by the fact that you could not find many places in Paris to enjoy a coffee with the wonderful croissants and pastries on offer at every boulangerie-pâtisserie. Now, the advent of Starbucks and the rise in coffee culture in general has led to many bakeries like Paul opening up café service, or ‘salon de thé’ in the fancier places. Truly the best of both worlds. Et vous? What’s your favorite thing about French restaurants?